Wear ’em, if you’ve got ’em. 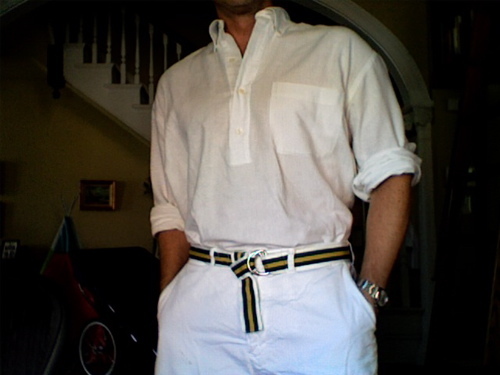 This entry was posted in Elegantology and tagged summer clothing. Bookmark the permalink. I love the blog in general and enjoy your outlook on life. Could you tell us who made the shirt? I really like popovers, but have not seen any offered. Tom, welcome and thanks. It’s off the peg and many years old. A combination of linen and cotton that fits me poorly, but like you, I love the style. I wonder if I can get anyone to do them again? Great shot. Must we say so long to summer?